An economical choice of function and price. Ideal for the aspiring trumpet player, it works well for an advancing trumpet player and may be used by a professional. 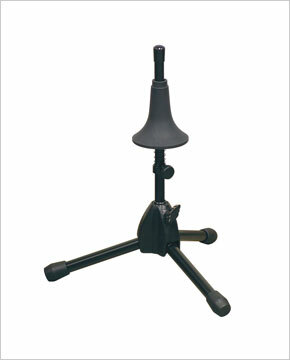 Compact stand with height adjustable spring cushioned bell cup. Stand features a fixed height of 16 1/2" and a base spread of 12". Mic stand style hub and tripod base. Folds to a compact size for travel and storage. Spring cushioned bell cup protects against dings and scratches.